1️⃣ Selection of the most praised Chateaus which quite often perform on par with First Growth magic 5. 2️⃣ Handpicked the best vintages for each Chateau individually. 3️⃣ Wine must have achieved its peak maturity. Wines served in pairs. Kicked-off with ‘96. Then followed village by village, building up on the power in style: St.-Julien, Pauillac, St.-Estephe. Finished with solo Margaux. Fresh, fruit forward and elegant. Fully developed and fruity on the palate with hints of coffee. Lighter body than the rest. 2nd Growth Classe. 70% CS, 25%M, 5% CF. Fermented in steel & concrete. Up to 20mo barrel aging in 60% new oak. Fining, light filtration. 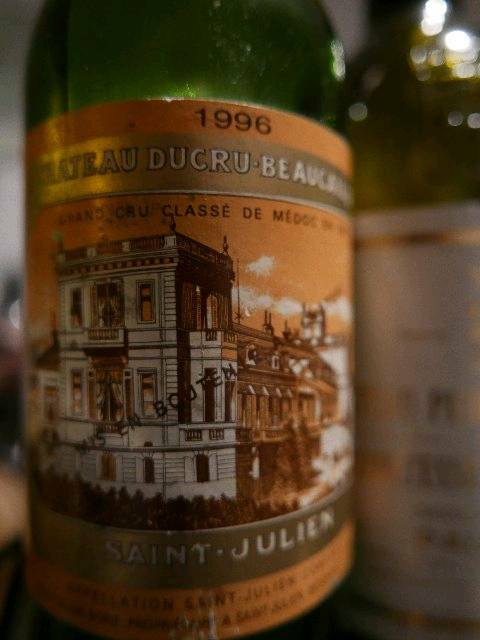 '96 is the best performing vintage for Ducru which is already reached its peak maturity. Reputation of Ducru suffered in late 80s-early 90s. Fully recovered now. Undervalued Super 2nd. Muscular but charming aromas of plum, bell pepper. Full body and concentration on the palate. 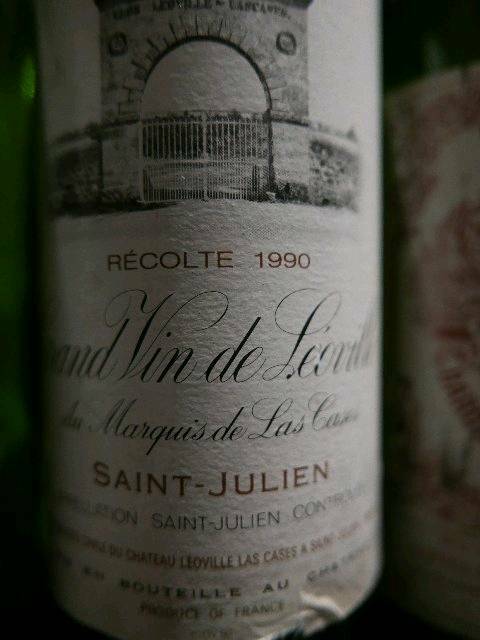 Just reached its peak maturity and will shine for decades. 2nd Growth Classe. 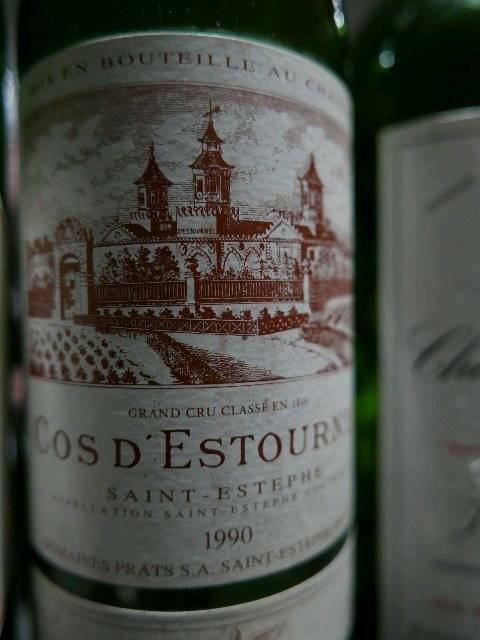 Usually 35% Merlot, but '96 was 75% CS, 15% M, 5% CF, 5% PV. Fermented in steel, 20mo aging in new oak renewed every 6mo, racking every 3mo. Fining, no filtration. One of the most consistent Pauillacs irrelevant of the vintage. High portion of M results in softer, fleshy wine. Cherry, tobacco, earth and spices. On a plateau and won’t improve with age. Don't wait, drink now. 2nd Growth Classe. 72% CS, 20% M, 8% CF. Fermented in 200hl wood barrels, 20mo aging in 50% new oak. Fining & filtration. 1 of the best buys among Super 2nds. Quality is there, but price is still behind. 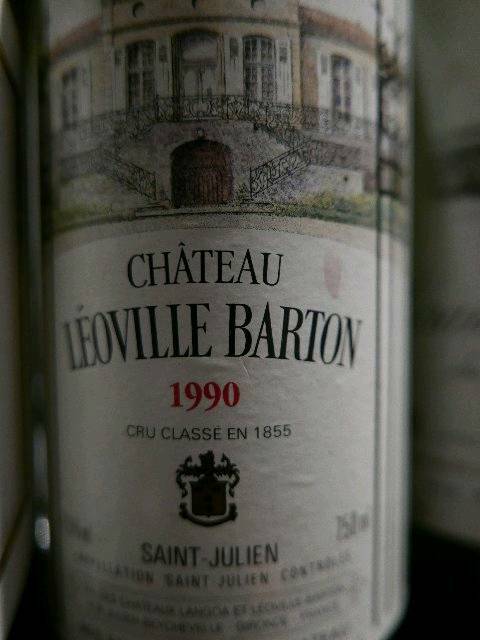 1990 is the best performing vintage for LB which is at peak maturity now. The King of St.-Julien. Powerful, dense with tremendous potential. Ripe fruits in leather box. Velvet texture. Generous and deep. Super concentrated and balanced. 2eme GC Classé. 65% CS, 19% M, 13% CF, 3% PV. Fermented in wooden, concrete, steel vats. Up to 24mo aging in 50–100% new oak. Fining, no filtration. Consistently of 1st growth quality. Huge estate 240 acres. Textbook Pauillac on the nose with cassis, dark fruits. Complex, concentrated with power and full body as it should be. 2eme GC Classé. 60% CS, 35% M, 4% CF, 1% PV. Fermented in steel tanks. Partly malo in barrel. Up to 18 mo aging in 70% new oak. Fining, no filtration. 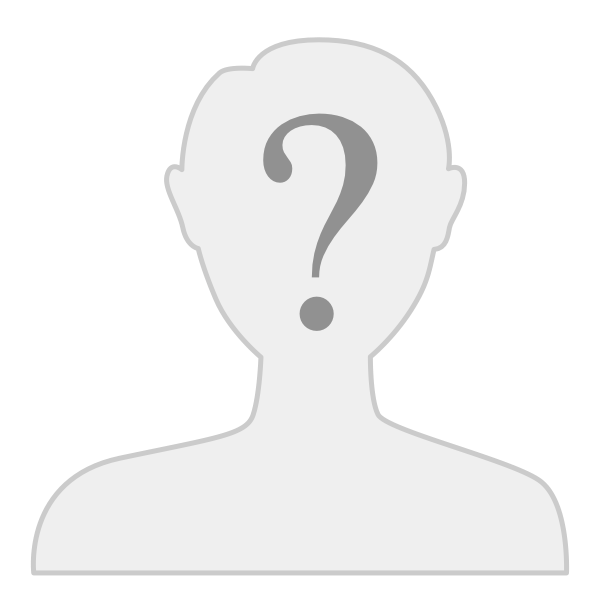 Now Chateau is managed by Christian Seely. Great quality improvement starting from 2001. 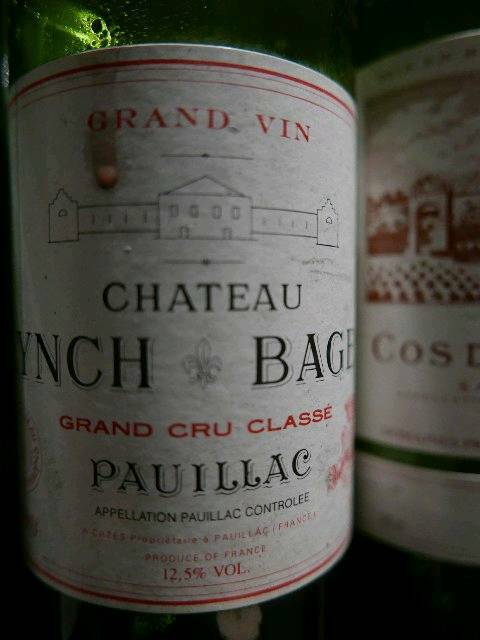 '90 is made by former winemaker Jean-Michel Cazes (ex Lynch-Bages). Outstanding wine! 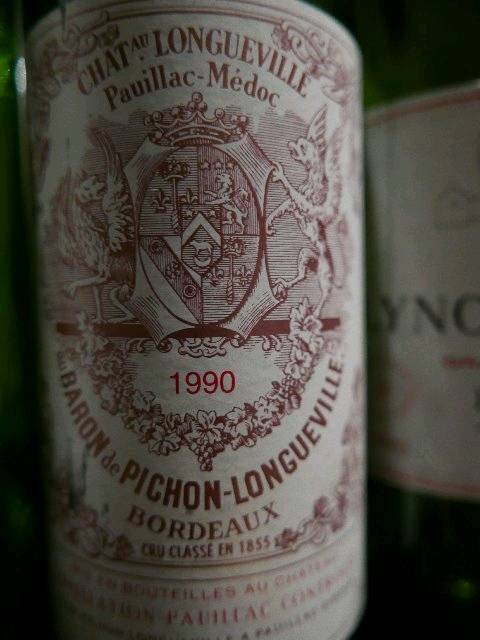 Bit modest as opposed to Pichon Baron, lesser concentration. More flowers and jammy fruits, juicy plum, cassis. 5eme GC Classé which in fact made its way to SuperSeconds! Large estate: 222 acres, planted w/ 73% CS, 15% M, 10% CF, 2% PV. Fermented in steel vats. 15mo aging in 60% new oak. Racking every 3mo. Fining w/ egg whites. Filtration only if necessary. 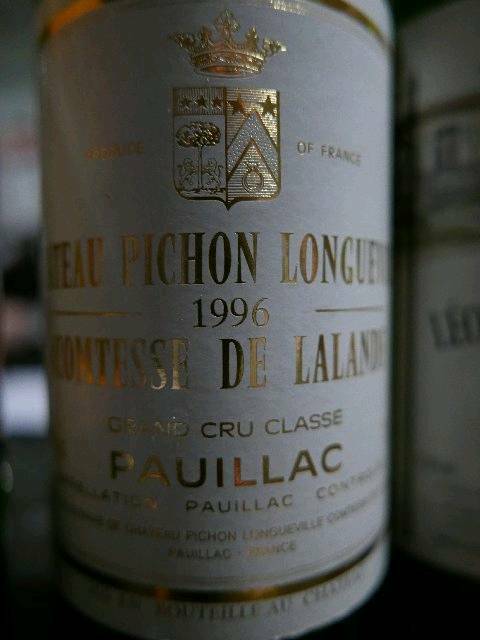 "Poor man’s Mouton Rothschild" is among best buys in Bordeaux. Plums, cassis, cedar, full of dark fruits and leather. Supreme texture and mouthfeel. Great representation of St.-E terroir. Reached its very peak maturity. 80s till mid-90s was super era for Cos, now inconsistent, overpriced. Speechless! This wine comes from another planet. Crazy wild rose in the pine forest. 4th dimension. Blockbuster wine of the night. Exceptional! Liquid magic. 2eme GC Classé. 65% CS, 25% M, 8% CF, 2% PV. Fermentation in steel tanks w/ frequent pumping-overs. 18 mo aging in 50–70% new oak w/ 6 rackings. Fining w/ egg whites. No filtration. RP100. He has probably tasted it ex-cellar. Classic Margaux with graphite of pencil shavings, rich in fruits, black tea. Fragrant and graceful. Pure elegance. 3eme GC Classé, but considered as SuperSecond. 47% CS, 47% M, 6% PV. Fermented in steel cone-shaped vats. 21mo aging in 45% new oak. Fining, no filtration. 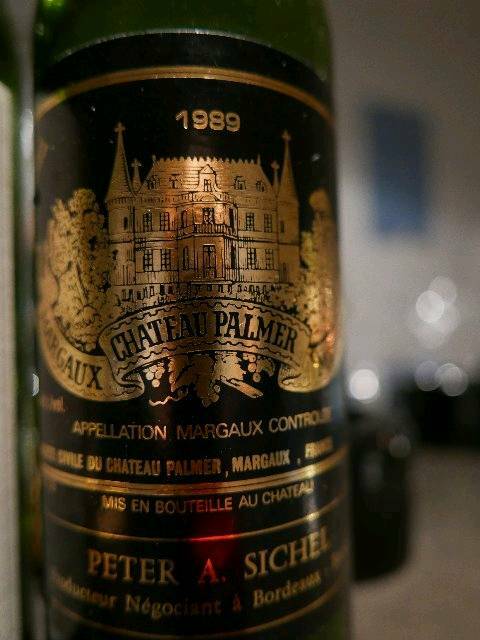 '89 was a super vintage for Palmer. The only true competitor to Ch.Margaux. Significant cellar renovations in late 90s make even better wines now. Sounds like an excellent tasting. Thanks for sharing. I opened a magnum of ‘89 Palmer almost a year ago. 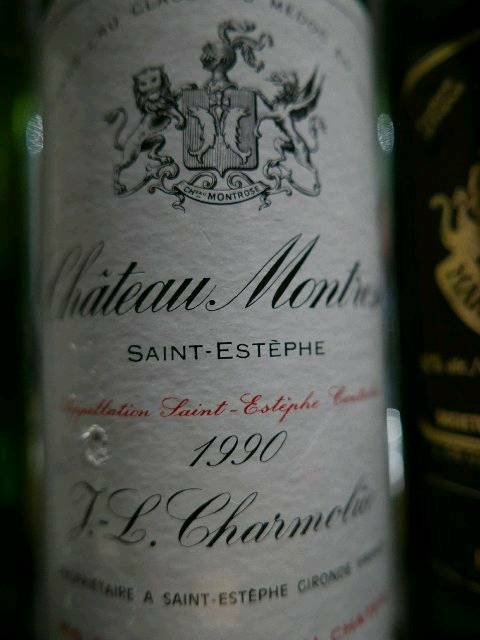 That was a real treat for Bordeaux wine enthusiast. Thank you for reading my TNs. Cheers! Oh, I hate when it happens. Did you get the chance to return it or get the refund? When such bad luck happens, I am trying to be positive and hope for some good luck the next time. The worst one I had was corked Krug 1982 Collection (~$1500).